Jewish culture in the first century treated women as second-class citizens. They had very few of the rights that men of that time had. Jesus respected all people equally, but he showed a special care for women. In this category, I will be sharing from God’s word about some of the encounters Jesus had with different women during his ministry on earth. Before, I continue with the story, we must first understand the history behind the Jewish hatred of the Samaritans. Samaria was the capital of the Northern Kingdom before it was conquered by the Assyrians. When they invaded the Northern Kingdom, many Jews were exiled to Assyria and foreigners from Babylon, Cuthah, Ava, Hamath, and Sepharvaim were brought in to Samaria to settle the land and keep the peace (2 Kings 17:24). Most Jews who remained in Samaria married the foreigners and they became a mixed race. The Jews from the Southern Kingdom considered themselves to be a pure race of Jews. They became very prejudiced against the spoiled blood line of Samaritans because they felt that they had betrayed their people and their nation by mixing their Jewish blood with foreign blood. Now at Jacob’s well in Samaria: Jesus was weary from his journey “and it was about the sixth hour” or noon. Usually the women went to fetch water from the well in the morning and in the evening. This woman came at noon to steer clear of others, probably because of her poor reputation. This woman must have been quite taken aback by Jesus’ (a Jew) request for a drink of water. First of all, she was a woman. Second, she was a hated Samaritan woman who was known to be living in sin, and she was in a public place. No respectable Jewish man would talk to a woman under such circumstances. But Jesus did. The Old Testament compares thirsting after God to one who thirsts for water (Psalm 42:1; Isaiah 55:1; Jeremiah 2:13; Zechariah 13:1). God is also called the fountain of life in Psalm 36:9, and the fountain of living waters in Jeremiah 17:13. When he told the woman that he could give her living water, he was laying claim to being the Messiah, the only one who could offer this gift that gratifies the very soul. He also knew that if she accepted his gift, her life would change drastically for the better. He does not wish for any one to hurt or suffer, and a life of sin is very damaging to the human spirit. No one had ever talked with her about her spiritual hunger and thirst before. 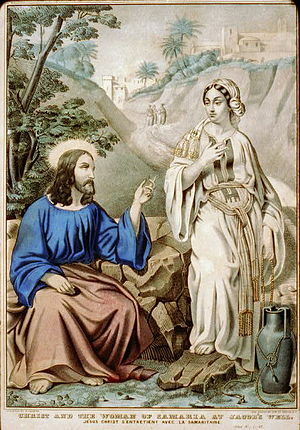 She misunderstood and thought that Jesus could give her an endless supply of water so that she would never have to return to the well. He was teaching her that our souls hunger for spiritual food and water, just as our bodies do for physical food and water. The woman became uncomfortable when Jesus hit her sin square on the head. She was quick to shift the focus off herself by changing the subject. It was a smokescreen to keep Jesus from her deepest need. It happens to all of us at one time or another, especially when we are under conviction about something. Jesus did not let her get away with that tactic. He brought up the very important point that where we worship is not as important as our attitudes when we worship. Wow! Can’t you just hear the authority ring from that passage? When Jesus referenced “salvation is of the Jews” he was saying that only through the Jewish Messiah would the world be saved. Jesus knew that the woman was familiar with the passages in the Old Testament that foretold of the coming Messiah. He finally got through to her.